The CT6100 Series microprocessor based circular chart recorders are available in 1-, 2-, or 3-channel variants. They combine the simplicity and clarity of pen drawing with the versatility of microprocessor control. Each channel is compatible with all industry-standard sensors and signals, including thermocouple types J, K, T, E, N, R, S, and B; Pt100 platinum RTDs; and 4 to 20 mA current loops. Low and high measurement ranges are provided for each input type; separate range cards are not required. Multi-input versions feature optoelectronic isolation of the input stages to eliminate troublesome installation earth loops. Multislope integrating 16-bit A/D converters ensure precise measurement by sampling the input every 0.5 seconds. Thermocouple and RTD characteristics are fully linearised. The recorders use automatic cold-junction compensation for thermocouple measurement. All CT6100 Series models feature alarm relays. Single-pen recorders are equipped with 3 fail-safe single pole changeover relays; 6 relays are standard on the 2- and 3-pen versions. Colour-coded LEDs indicate the status of each relay. All relay functions are user selectable: setpoint values and hysteresis levels are entered directly via the keypad, while relay action and channel assignment are selected from user-friendly menus. Circuit precision is matched by the backlash-free pen-drive mechanism, which has a positioning resolution of better than 0.1%. An integral feedback potentiometer enables closed-loop monitoring of each pen position. Each recorder uses a low-maintenance stepper motor. 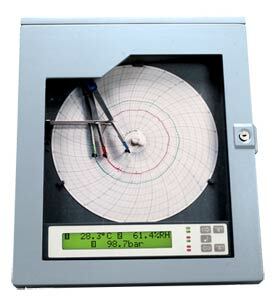 The rotation speed of the 244 mm diameter chart is microprocessor controlled and user programmable. All CT6100 recorders are housed in a strong moulded case that can be panel or surface mounted. A gasket-lockable door protects internal components from harsh industrial environments and offers protection rated to IP55 (NEMA 12). A tough acrylic window lets the user view the chart trace, digital channel readings, and alarm status with the recorder's door closed.